Onondaga Audubon President, Alison Kocek, and Board Members Michele Neligan and Frank Moses attended the Onondaga Lake Conservation Corps shoreline restoration project this weekend and had a wonderful time observing the returning wildlife, meeting and working with amazing volunteers, and planting native plants to enhance the habitat even further! We encourage you to join us at the next #OLCC event! This past Tuesday, March 1, 2016, Onondaga Audubon Board Member, Michelle Stantial, spoke out to the members of the Onondaga County Legislature on behalf of the society regarding the Lakeview Point Landing that has been proposed to be built to allow boats docking ability on Onondaga Lake near the amphitheater (see link below for the statement she read). While Onondaga Audubon is not opposed to the building of this dock, we do feel that its current suggested placement location could be detrimental to the inhabitants of the newly created wetland area just to its south that is known to provide stopover and potentially future nesting habitat to shorebirds, terns, and other waterbirds. If you would like to find out more about Onondaga Audubon’s stance on this issue, please find the following letter, written by Onondaga Audubon President, Paul Richardson and read to the Onondaga County Legislature by Michelle Stantial. Hundreds of community volunteers have become environmental stewards of Onondaga Lake since the formation of the Onondaga Lake Conservation Corps in summer 2012. The Corps is an expanding organization of community volunteers who are contributing to restoration projects that are creating or improving wildlife habitat in the Onondaga Lake watershed. Founding partners of the Corps include Montezuma Audubon Center, Onondaga Audubon Society, Parsons, O’Brien & Gere, and Honeywell. Click this link to to see the Corp in action on the Onondaga Lake Conservation Corps YouTube page. EPA Recognizes Local Environmental Stewardship Organization Founded by Honeywell in Partnership with Audubon and Central New York Engineering Firms. With a goal of engaging citizen scientists and environmental stewards in the restoration of the Onondaga Lake watershed, Honeywell partnered with Audubon New York, Montezuma Audubon Center, Onondaga Audubon Society, Parsons, and O’Brien & Gere to create the Corps in 2012. 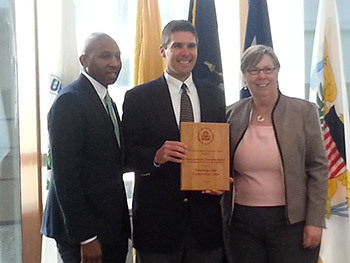 Chris Lajewski, director of Montezuma Audubon Center, accepts a 2015 Environmental Champion Award from EPA Regional Administrator Judith Enck on behalf of the Onondaga Lake Conservation Corps. Donovan Richards, Chair of the New York City Council’s Committee on Environmental Protection, is on the left. More than 500 volunteers have planted about 4,500 plants, trees, and shrubs in the Onondaga Lake watershed since the formation of the Onondaga Lake Conservation Corps. Left: Community volunteers participate in the first Onondaga Lake Conservation Corps event at the Geddes Brook wetlands in July 2012. Right: Geddes Brook wetlands in September 2014. Geddes Brook was recognized with the 2015 Outstanding Civil Engineering Achievement Award by the American Society of Civil Engineers, Syracuse Section. The Corps seeks to inspire future stewards of Onondaga Lake and its watershed through a hands-on, experience-based program that offers citizens and organizations the opportunity to participate in activities that help restore and sustain Onondaga Lake and its value as an Important Bird Area. 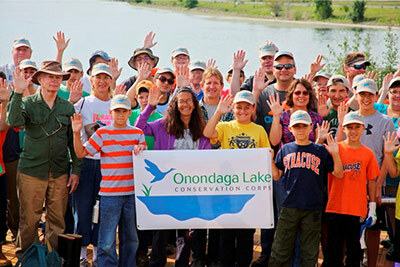 Left: Corps volunteers pledge to protect and conserve the Onondaga Lake watershed in July 2014. Right: Corps volunteers participate in a citizen science bird-watching survey in October 2014. The Corps has contributed to the improvement of 44 acres of wetlands and other areas that are home to 320,000 native plants and more than 110 species of fish, birds, and mammals. Left: Corps volunteers plant a tree near Harbor Brook in June 2013. Right: Volunteers build habitat structures on Onondaga Lake’s western shoreline in July 2014. Left: Corps volunteers plant a tree near Nine Mile Creek in October 2012. Right: Volunteers work with experts to examine the quantity and diversity of various species in the Geddes Brook wetlands in July 2012. Onondaga Lake Conservation Corps Members Plant Native Shrubs and Trees and Build Habitat Structures in Newly Created Wetland. Fifty-five volunteers gathered along Onondaga Lake’s western shoreline last month to help build a new wetland. Volunteers planted shrubs and trees, built habitat structures, and participated in citizen science monitoring by tracking native birds. They are part of the Onondaga Lake Conservation Corps, an expanding organization of community volunteers who are contributing to restoration projects that are creating or improving wildlife habitat in the Onondaga Lake watershed. Left: Margaret DeCarlo, of Clay, N.Y., works with Keith Cardinali, a scientist at O’Brien & Gere. Right: Chase Salmons and Linda Salmons, of Camillus, N.Y., plant native species along Onondaga Lake’s western shoreline in an area that will become a new wetland. Since the formation of the Conservation Corps in summer 2012, eight events have brought together hundreds of volunteers who have become environmental stewards and Corps members. Onondaga Lake Conservation Corps members take a pledge to protect and conserve the natural resources of Onondaga Lake, promising to educate future generations about becoming caretakers of the water, air, land, and wildlife. Left: Aaron Hludzenski, of Geneva, N.Y., builds a rock pile to support turtle habitat. Turtles may use these structures to nest and forage, or as protection from the weather and predators. Right: Corps volunteer Julie Biondolillo and her daughter, Mara Biondolillo, of Pennellville, N.Y., plant wetland habitat. After the event, water was added to the wetlands to create optimal habitat conditions. Left: Conservation Corps members track native birds on a birding walk along the Onondaga Lake West Shore Trail Extension. In total, 41 bird species were identified. Left: Pictured left to right, Audubon volunteer Frank Moses assists Corps members Nicole Stephenson, of Phoenix, N.Y., Karol Wright, of Baldwinsville, N.Y., and Shannon Fitch, of Liverpool, N.Y., in identifying bird species. Right: Mary-Margaret Wright, of Baldwinsville, N.Y., uses binoculars to observe and identify bird species. “Corps members learned from wetland and wildlife biologists about methods to create and restore the types of habitats that we hope will attract a wide variety of amphibians, reptiles, small mammals, and bird species to the lakeshore,” said Steve Mooney, managing scientist at O’Brien & Gere, pictured above at left. “This was a great opportunity to assist the designers and constructors of these habitats, and learn hands-on how we’re improving the quality of the Onondaga Lake shoreline.” Right: Water is pumped into the wetlands, beginning the transition to support habitat and plants. Community volunteers at July 19, 2014 Onondaga Lake Conservation Corps Event. Founding members of the Corps include Montezuma Audubon Center, Onondaga Audubon Society, O’Brien & Gere, Parsons, and Honeywell. To learn more about the Onondaga Lake Conservation Corps or to participate in future activities, please contact montezuma@audubon.org or call 315-365-3588. For more information on the Onondaga Lake cleanup, please visit http://www.lakecleanup.com. Onondaga Audubon is especially concerned about the impact that the amphitheater will have on wildlife, especially the birds that utilize Onondaga Lake, an Important Bird Area. Here is a PDF of a letter sent to Onondaga County that states our concerns. If the project proceeds as planned, approximately 100 acres of land will be impacted. The report lacks on-site field data about the bird species that would be affected by the project’s extensive habitat alteration. We also feel that the potential impact of the project on species like Indiana and long-eared bat has not been adequately addressed. A project of this size will certainly impact the character of the undeveloped western shore of Onondaga Lake.